You’re more likely to spot a herd of bison or come across a grizzly bear than you are to encounter humans in the Northwest Territories. Everything is extreme here, from the isolation (it’s very remote) to the daylight (or lack of it) and the size of the wildlife (humongous). Yellowknife, where most of the territories’ population and commercial activity is based, may not be much to write home about, but it’s the perfect launch pad for outdoor adventure. Arrive in winter, and catch a glimpse of the Northern Lights. 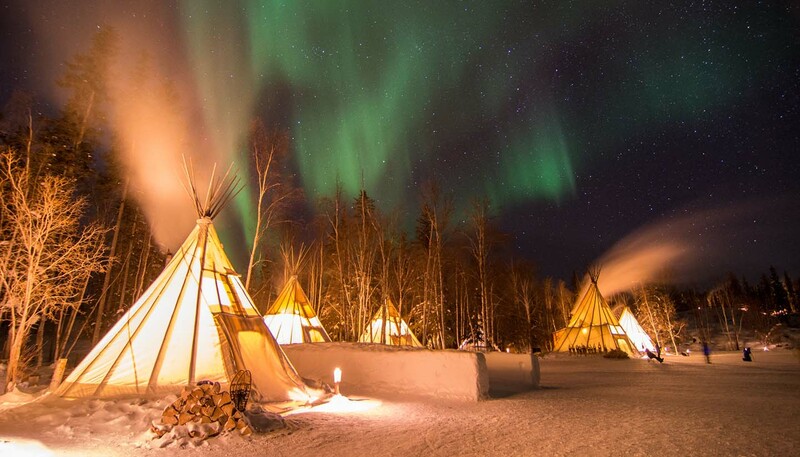 Watch the celestial spectacle from a luxury lodge or hunker down in a cosy teepee. Witness a 3,000-strong herd of reindeer cross the frozen Mackenzie River, and celebrate the end of winter with harpoon-throwing contests, dog sledding and skidoo races at Inuvik’s Muskrat Jamboree. In the summer pay a visit to endangered whooping cranes at Wood Buffalo National Park and take a sightseeing flight over the park’s rare salt plains and free-roaming bison herds. Further north, the territories extend far beyond the Arctic Circle, well into polar bear territory. Don't forget to look up: the skies here contain some of the rarest bird species on the planet. Road trips in the Northwest Territories are no Sunday afternoon drive. The Dempster Highway runs 454 miles (730km) from Dawson City, Yukon to Inuvik, and is open year-round come rain, shine, ice or snow. The territories’ outdoor activities are many and varied. Anglers can hook lake trout that weigh more than their children. Kayakers can bounce through the Class IV Cassette Rapids on Slave River. Hikers can hit the remote Canol Heritage Trail through the Mackenzie Mountains. And the world’s leading mountaineers can tackle Nahanni National Park’s Cirque of the Unclimbables. With a name like that, how could they resist? 1,346,106 sq km (519,734 sq miles).